HASHBYTES is one of the useful functions when it comes to generate hash values on the basis of different types of algorithms. In the earlier versions, it supports MD2, MD4, MD5, SHA, SHA1 algorithms and these algorithms are limited up to 20 bytes only. 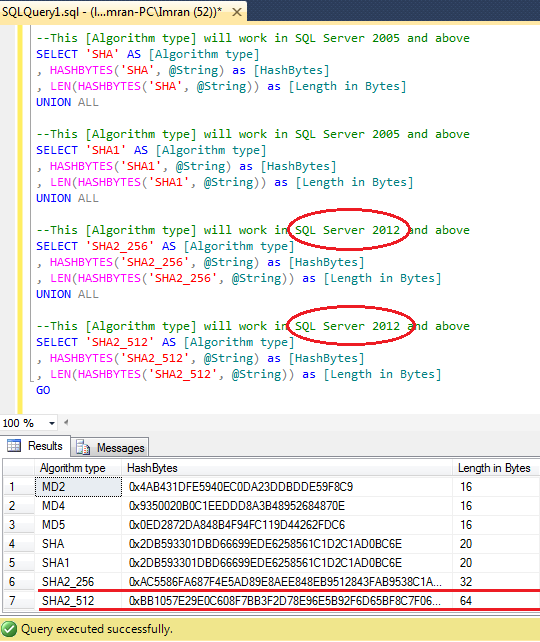 In SQL Server 2012, we have an enhancement in this function and now it supports SHA2_256, SHA2_512 algorithms that can generate 32 and 64 bytes hash codes for the respective input. Note : If you execute above script in earlier version of SQL Server, it will return NULL value for SHA2_256 & SHA2_512 whereas it generates the hashbytes value for all other algorithms. 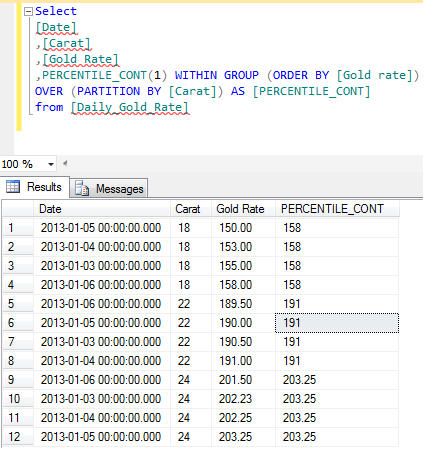 In this article, we will discuss another important analytical function introduced in SQL SERVER 2012 namely PERCENTILE_CONT. Lets discuss PERCENTILE_CONT syntax, purpose, return type with simple examples. The purpose of this function is to calculate the percentile based on a continuous distribution of the field. In other words you can say that it also calculates the median but just to base it on the median, is not correct. The return type is float(53) and the value of percentile should be between 0 and 1. Given below is the formula that will help you to understand how it works. Lets take gold rate as an example to check their percentile based on a continuous distribution of the gold rate in one week. Lets calculate the formula in excel and view the results. 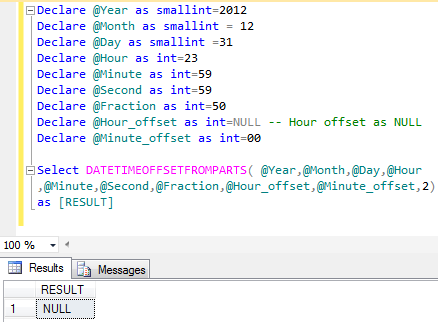 DATETIMEOFFSETFROMPARTS is one of the important sql server functions required when we need to make date and time from offset and precision. Let me explain its syntax, parameters, purpose and examples in detail. @Year : A valid integer for year. @Month : A valid integer for month range from 1-12. @Hour : A valid integer for Hour range from 0-23. @Minutes : A valid integer for Minutes range from 0-59. @Seconds: A valid integer for Seconds range from 0-59. @Fractions : A valid integer for Fractions range from 0-9999999. @hour_offset : A valid integer for hour portion of the offset range from -14 – +14. @Precision : A valid integer for Precision range from 0-7. This function requires year, month, day, hour, minute, seconds, fractions,hour portion of offset, minute portion of offset & precision as a parameter (All parameters are mandatory) and returns a valid datetimeoffset as a result. If we pass any invalid date, time or offset parts, it will generate an error. Also if we pass NULL values to any of its parameters except Precision parameter, it returns NULL value. It will generate an error because only valid offset parts are allowed as a parameter. 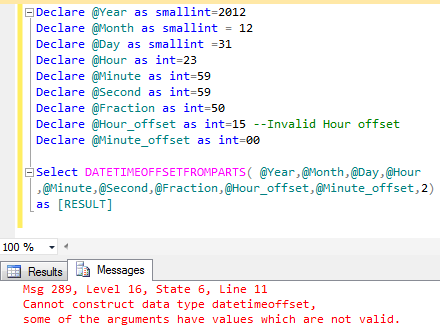 Cannot construct data type datetimeoffset, some of the arguments have values which are not valid. In my previous article I discussed about CUME_DIST. In this artcile we will discuss another important analytical function introduced in SQL SERVER 2012 and that is similar to CUME_DIST namely PERCENT_RANK. Lets discuss PERCENT_RANK syntax, purpose, return type, simple examples. The purpose of this function is to calculate the relative rank of a row within a group of rows. PERCENT_RANK of any set of First row value will be 0. 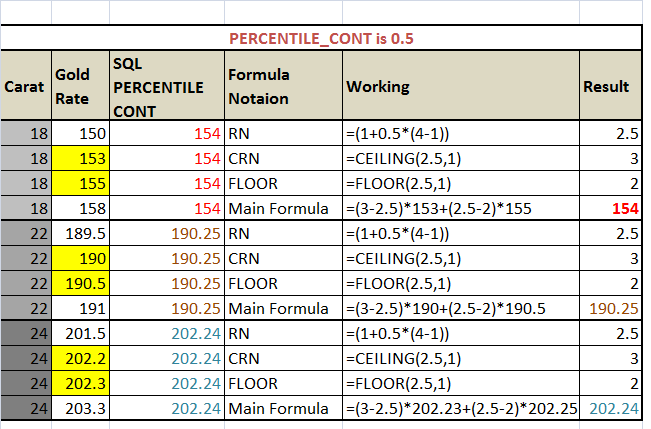 PERCENT_RANK includes NULL values but they are treated as the lowest possible values. The return type is float(53) and the values are always between 0 and 1. Lets take gold rates as an example to check their relative rank in one week. If you look at Column E and Column H, Column E is calculated by SQL Server and Column H is calculated manually to understand how it works. 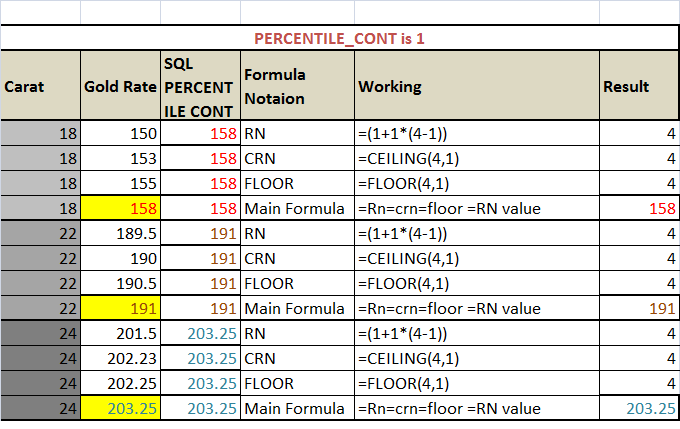 To calculate PERCENT_RANK() manually, you need two values. 1. Row Number based on the values (meaning less than or equal to value) (Column F). But first value will always be 0. Column G: It is simple; you need to calculate the total number of records and reduce 1 from it. Column F: You simply need to get the row number based on the values. But first row number will be 0 as well, so you need start counting it from row number 2. You can observe that it is simple row number till row number 2 but in row number 3 & 4 we found the same Gold rate, so it picked up 2 (due to less than or equal to value criteria) as row number. Finally, you need to divide Column F by Column G to get the PERCENT_RANK() manually. The same functionality PERCENT_RANK() does automatically in SQL. Lets insert other Gold rates to proceed with this example. 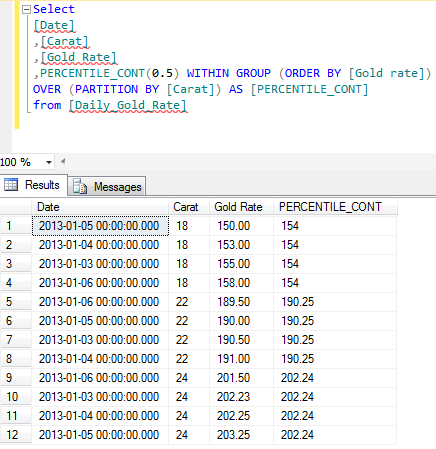 CUME_DIST is a very nice & helpful analytical function introduced in SQL SERVER 2012. In this article, we will discuss its syntax, purpose, return type, simple examples and real world examples also. The purpose of this function is to calculate the cumulative distribution of value in a group of values. Lets take gold rates as an example to check their cumulative distribution in one week. If you look at Column E and Column H, Column E is calculated by SQL Server and Column H is calculated manually to understand how it works. To calculate CUME_DIST manually, you need two values. Column G is simple; you need to calculate the total number of records. Column F: You simply need to get the row number based on the values. You can observe that it is simple row number till row number 2 but in row number 3 & 4 we found the same Gold rate, so it picked up 4 (due to less than or equal to value criteria) as row number. Finally, you need to divide Column F by Column G to get the CUME_DIST manually. The same functionality CUME_DIST does automatically in SQL. In my previous article, I discussed about LAG. Today, we will discuss another analytical function namely“LEAD” in SQL SERVER 2012. This function performs exactly opposite functionality of LAG. In simple words we can say that if we need to pick up any value from the next row(s) of the current row, we can use this function and get it, instead of using self joins. The purpose of this function is to get the next row in front of the current row in the same result without using any self joins. And once you get the next row parallel to current, you can easily compare their values and perform any analytical task. 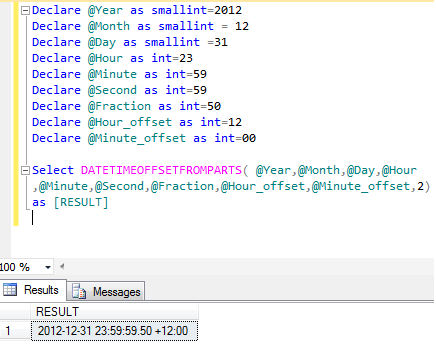 Lets create an example to explain “LEAD” function in SQL SERVER 2012. In the above example, you can view that if LEAD could not find the value it gives you NULL. In order to avoid NULL, you can pass the third parameter and it will be replaced by NULL. In the example given below, I replaced NULL with empty spaces (”). In the above examples, you can view that LEAD function picks one row subsequent value than current row. In this example, we will set the offset value to 2 to pick up two rows’ next value than current. In the earlier version of SQL SERVER, if you need to find current designation with the promotion of any employee in the same result set , you need to use the self join to achieve it. But in SQL SERVER 2012, you can use the LEAD function to achieve it. Lets create an example to explain this. Today, we will discuss one of the important analytical functions namely “LAG” in SQL SERVER 2012. In simple words we can say that if we need to pick up any value from the previous rows in the current row, we can use this function and get it, instead of using self joins. Lets discuss each and every aspect of this function. Also we will discuss the need/importance of this function in SQL server. By using this function, we can reduce the number of codes because in the previous versions of SQL SERVER, to do the same, we had to use self joins to achieve it. The purpose of this function is to get the previous row next to current row in the same result without using any self joins. And once you will get the previous row parallel to current, you can easily compare their values and perform any analytical task. Lets create an example to explain “LAG” function in SQL SERVER 2012. In the above example, you can view that if LAG could not find the value it gives you NULL. In order to avoid NULL, you can pass the third parameter and it will be replaced by NULL. Given below example, I replaced NULL with empty spaces (”). In the above examples, you can view that LAG function picks one row previous value than current row. In this example, we will set the offset value to 2 to pick up two rows previous value than current. In the earlier version of SQL SERVER, if you need to find previous day exchange rate, you need to use the self join to achieve it. But in SQL SERVER 2012, you can use the LAG function to achieve it.